West Bromwich Albion boss Darren Moore. Picture by PW Sporting Photography. West Bromwich Albion boss Darren Moore felt 'extra-time was a bridge too far for us with ten men' after they fell to a 3-1 home defeat in extra-time against Brighton & Hove Albion in tonight's FA Cup fourth-round replay. The Baggies opened the scoring on 77 minutes thanks to Kyle Bartley but the Seagulls hit back five minutes later after a defensive mistake saw Florin Andone nip in and score. The turning-point in the game came ten minutes into the first-half of extra-time as Hal Robson-Kanu had to leave the pitch due to an injury. Albion had made all three subs in normal time, as well as their fourth substitute allowed in extra-time, leaving them with ten men. 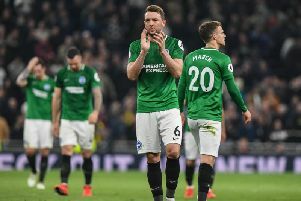 This proved to be their undoing, as Brighton substitute Glenn Murray's double saw the Baggies knocked out of the cup despite a valiant effort. Speaking to BBC Sport after the game, Moore was full of praise for the youngsters that played in the loss but rued the loss of Robson-Kanu in extra-time. He said: "It is a disappointing result but I have to be pleased with the performance. The younger ones who came in showed that they have grown in stature tonight. "The turning point in the game was losing Hal Robson-Kanu to injury, we will check on him over the next 24 hours. "It looked like we were going to win it, we scored so late in the game but it only takes a second to score a goal. Extra-time was a bridge too far for us with ten men. "Chris Hughton was able to bring on some top players, they are a good team and they made the extra man count."